Graham’s Lane Smith fires a ball across the infield on Tuesday against Triad. Smith had a nice game, going 1-for-2 with a double and preventing a run when he threw out a runner at the plate in the third inning. 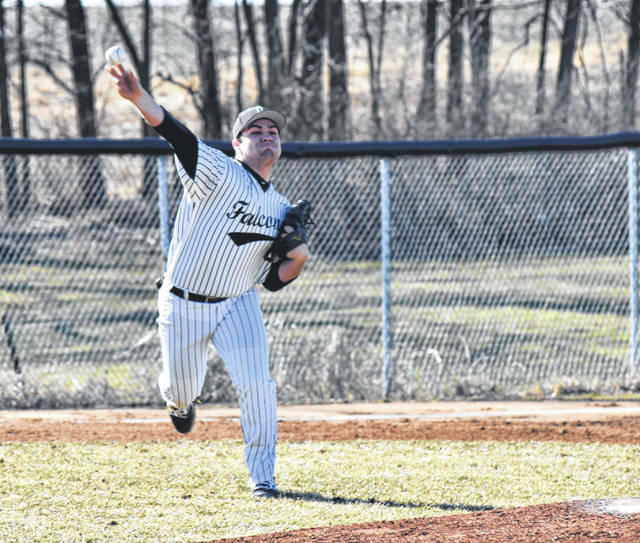 ST. PARIS – Graham took an early 3-0 lead and cruised to a 3-1 victory over Triad in non-league baseball on Tuesday. The Falcons got on the board in the bottom of the first when Josh Lewis hit a hard grounder to the right side with a man on third and picked up an RBI with his sacrifice. Another run scored in the second inning on a Triad error in right field with runners on first and second with two outs. With runners at the corners a batter later, a balk pushed in the third run. Triad scored its run in the top of the third when Austin Bails knocked it in with a slow-rolling single and beat it out with his great speed. The Cardinals had other opportunities to score in the frame, but Graham was able to work out of a jam when third baseman Lane Smith cut down a runner at the plate on a ground ball with one out. Triad loaded the bases with two outs, but was again unable to score. Chase Adams went 2-for-3 with an RBI for Graham, Smith was 1-for-2 with a double and Logan Anthony was 2-for-3 with a double. Graham (2-1) hosts Shawnee on Friday while Triad (0-1) travels to Fairbanks on Thursday. WAPAKONETA – West Liberty-Salem defeated Wapakoneta, 11-0, in five innings of non-league softball on Tuesday. Kelsey Day got the win and was 2-for-3 with a triple and 3 RBI. Hallie Strapp was 3-for-4 with a double and 4 RBI and Hannah Riblet was 3-for-3 with an RBI. The Tigers move to 2-1 overall. In the jayvee game, WL-S won, 19-2. Maycee Miller got the win. Emily Bolton went 4-for-5 with 3 runs scored, Alexa Stoll was 2-for-3 with 3 RBI, Aleah Reed was 2-for-3 with 4 runs scored and Kaydence Waldren had 3 RBI. SPRINGFIELD – Kenton Ridge defeated Mechanicsburg, 6-5, in non-league softball on Tuesday. The Indians struck for three runs in the top of the first inning, but the Cougars battled back and took the lead with a four-spot in the bottom of the fifth. Megan Alspaugh was 2-for-3, Audrey Ayars had a double and an RBI and Hanna DeLong had 2 RBI for the Indians. Mechanicsburg (0-1) hosts Northeastern on Thursday. https://www.urbanacitizen.com/wp-content/uploads/sites/36/2019/03/web1_LaneSmith032619.jpgGraham’s Lane Smith fires a ball across the infield on Tuesday against Triad. Smith had a nice game, going 1-for-2 with a double and preventing a run when he threw out a runner at the plate in the third inning.